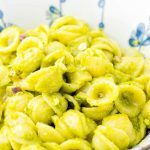 This Pistachio Pesto is super easy to make and on the table in under 5 minutes. Even the pickiest kids will crave this served on pasta, bread, mixed with dipping sauce, as pizza sauce, sandwich spread, or combined with your favorite salad dressing for more flavor. The options are countless, but one is always the same: it is your to go pesto recipe for quick dinner recipes. No one would ever believe it is vegan pesto. It tastes so much like the real deal, no matter what diet direction one follows, this such an amazing keeper for all easy family meals. Simply combine pistachios, chopped garlic, vegan Parmesan, olive oil, and basil in the bowl of a food processor. Season with salt and pepper and run your food processor until everything is combined and blended smoothly.